If You Want to Have Fun, Just Say Cheese! Traditional Photo Booth - Most Popular! Green Screen Photo Booth - All New! Say Cheese started with one goal in mind - create the best photo booth company. It is the driver to hitting so many milestones including becoming a leader in the industry, snapping over 3000 events (and counting), an amazing team, and no shortage of awards and reviews from you, our clients! Any excuse to have a party is a great excuse for us! Allow us to come join the fun by helping you create memories, laughs, and smiles at your next events. Such a blast with the KEYE Team on their 'We Are Austin' Segment! See what you'll get with our all inclusive photo booth package. 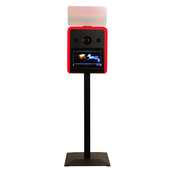 Learn more about Say Cheese Photo Booths and why you, our amazing clients, are the driving force behind what we do! Happy birthday from a photo booth, America! Smile for a great cause on World Refugee Day!